I left it up to chance. 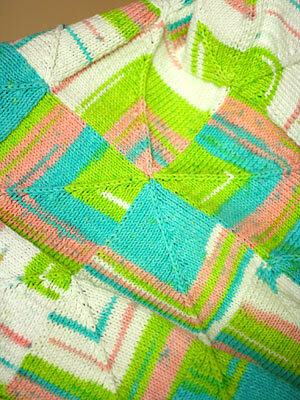 I knit the mitered squares continuously, and let Katia Jamaica control the flow of the colors. And I think it turned out okay! Plus, I wasn’t entirely sure how I would like this arrangement of miters – a center square with “petals” radiating out, but I think I like it! Yes? No? Acceptable baby gift? Pattern: I listed the full pedigree and evolution of this project in this post. It’s basically a combination of the pattern in Mason-Dixon Knitting , Mari’s Jamaica Baby Blanket, and Kay’s No-Sew Mitered Square Blanket tutorial. I threw in a few of my own modifications, and voilà! Needles: US 5 circs; 24″ INOX Express for the main portion, and a longer Susan Bates Silvalume for the border. Yarn: Katia Jamaica, color 4000, 4 skeins. The yardage of this yarn is perfect: one skein is enough for exactly 9 of those little miters. I didn’t run out of yarn and I had maybe 5 yards left over. The edging is GGH Sprint(discontinued), color 32, about a skein and a half, used while holding two strands together. Both yarns are machine-washable: a must-have for a baby blanket! Finished dimensions: about 31.5″ square. I was able to get nice, rounded corners by knitting what amounts to a wedge where two sides of the border meet. The actual increases are closed yarn-overs, which I always find stretchy and accommodating when it comes to maneuvering in tight quarters. As I mentioned, I have no aversion to seaming or weaving in ends. But when it comes to a double-sided project like a blanket, I like both sides to look as neat and tidy as possible. I think I was able to make the wrong side pretty by weaving in ends as I went along. Even though this blanket is destined to be a gift, I’ll always remember it as “my honeymoon blanket”. I hope the pleasant, sunny vibes travel along with it :). Oh Kathy – it is really cute! Do you really want to give it away? You might want to save it for your own babies! Oh, it is so perfect! I love the colors and the placement of both the colors and the squares. It just shows that it was a wonderful honeymoon! It is a really lovely gift, and you have so many good feelings and thoughts tied into it, that’s the best part. Does it make me horrible that secretly I was hoping it was for you?? Great blanket–both sides. The baby who receives the blanket is one lucky baby. I frequently line baby blankets so that the “wrong” side is hidden under the lining of lightweight polar fleece. I tie the corners of the squares to the fleece with small pieces of yarn. It’s like an unstuffed quilt. Just a suggestion. I think that it turned out beautifully! It will be a wonderful gift – I’m glad that turned out so well since it’s your “honeymoon blanket”. Not to be bossy, but you’re sure you don’t want to keep it in case you have kids? I’m sure they would love to hear the story about their blanket someday…. It’s beautiful, and I love that you have such nice memories attached to it! Lovely blanket! Absolutely an acceptable gift, the colors are so very happy that the blanket is perfect for a baby. Lovely. And I love how the randomness of just letting the yarn flow turned into a really attractive design of well balanced colors. It’s absolutely fabulous. And all that love you knit into it is bound to bring happy thoughts to the lucky recipient. I really like it! I like the arrangement of the miters, the way the colors worked out, the yellow border, and the neat wrong side too. Voila is indeed the word! Serendipity is a marvelous thing; what a great blend of yarn, patterns, and the seeing eye. And a wonderful place and time! A gift blanket created on ones honeymoon can only be wonderful things to the recipient. Very nice! This is gorgeous! What a gift. Beautiful. And the color changes are perfect. The various squares pop out and recede, like a 3D collage. That is such a cool blanket. I for one would treasure it if I were to get it! It’s lovely! Definitely reminiscent of a tropical island. It’s so cute that you have wonderful memories associated with it. Absolutely beautiful! The primary and secondary patterns work like any good quilt would. The recipient is very lucky indeed. i absolutely LOVE this! what a lucky baby! It’s wonderful. I know that it’s a gift, but if you can knit up something cute very quickly, I’d vote for keeping it. There are such special memories wrapped up in that blanket. Honestly, though, I know that you are not the type who needs to hang on to an object to preserve a memory, so you may not need the blanket in the way many people might. 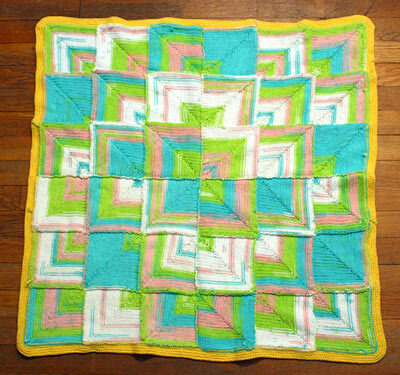 It looks great- I love the arrangement of the miters- It really amps up the quilt-ness of it. That’s awesome for a baby blanket. (I’ve been told it can just be thrown in the wash, although I’m more gentle with the Katia tank I made. By “closed yarn-overs”, do you mean a lifted-strand increase? Or a yarn-over that you then twist in the next row? Some lucky baby is going to love this! What a precious baby blanket! The colors are gorgeous, and the arrangement worked out great. You’ve made me want to try the mitered square blankets! I can’t believe how great that turned out! I am kind of a control freak and not very good at leaving things up to chance in case they turn out terrible, but look what can happen! Greatness! Beautiful! I love the contrast of the yellow edging. Great choice of yarn. I have trouble with ‘random’ so this would solve it. A wonderful gift, but maybe something special to save for a little grumpy baby someday. It is so random and so ordered all at once. I love it! oooh, those blue blocks, though…. eep! It is poifect. For some reason, it says “daffodils” to me. I love mitered squares!! This blanket is adorable. The edging ties it all up well. Wow! Gorgeous. I’m thinking of running out to get pregnant just in hopes of getting one! ;)Nice work. Are you kidding? It’s a beautiful baby gift! Great work. That’s really lovely … a beautiful gift! That is more than acceptable! It’s beautiful! I second Anna’s comment- lovely gift. Luck baby! It’s absolutely perfect! And I know all about adding love to a blanket. A bunch of the squares for my log cabin were knit on a tropical vacation with my love and for weeks after I’d find sand and just be transported back to our island. What a wonderful gift! I have to say though – you shame me! My poor miters sit neglected in a box. That is a gorgeous blanket. I think it would be a wonderful baby blanket. Oh! Those little wedgy corners are just the cat’s meow! Neat-o-keen! Wow! 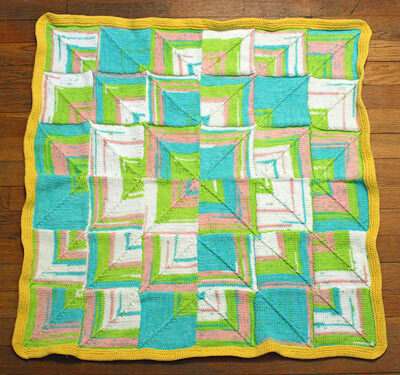 I love it, and it has gotten me thinking and planning… How large is your finished blanket? I love how it radiates! Great idea! I’m getting married in June, and I think a blanket is a great project to work on while travelling! I’ll have to make a honeymoon blanket also. Wowee. That is more than acceptable for a baby gift. Beautiful. I’ve got to make one. I think your arrangement of squares is my favorite I’ve seen yet. I love the center “petal”. 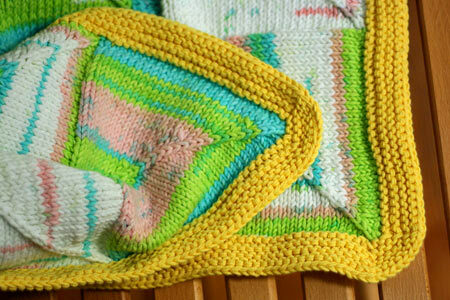 The colors and the edging are just perfect for a baby blanket. The recipient will be delighted! I really like the layout of mitred squares. It looks a lot nicer than the version where they are put together 4×4. Nice job on the blanket. WOW! What a wonderful baby blanket. I think it came out great nice and bright and cheery. I LOVE the blanket. The petaly effect of the miters is my favorite part. I actually want to make a mitered balnket now! Very lovely blanket! I was wondering if there was more to “weaving in the ends as you go along” than the obvious – is there some method of weaving in ends as you go that looks better than the methods used once something is completed? I read your blog frequently but never post – This time I have to. It’s a lovely blanket, full of beautiful thoughts and loving intentions. It will make a PERFECT baby gift! Very special! I am sure the recipient will love it. So cool. After seeing yours and Mari’s I am so tempted to jump on the bandwagon. I can’t think of anything else to knit with Jamaica. I do believe it’s an “acceptable” baby present, for sure. Wow. Yes. Very acceptable baby gift, especially for an exceptional baby. 2. I don’t mean to pry, but why not consider saving this in case you and the Mr. have any tiny grumps of your own? Being the “honeymoon blanket” it would be an automatic heirloom. Wouldn’t it be wonderful to save for YOUR future baby??? We don’t always need to gift our knits! Very cool! I love how the miters remind me of a Moravian star. That is one lucky baby! Stupid question: how do you weave in ends as you go? Oh my word! That is one of the most beautiful baby blankies I have ever seen! Thank you for sharing… I’m off to find some Katia so I can be a copy-cat. That blanket is beautiful! I’ve just recently realized that I could knit blankets (I used to think that they would be way too much work.) I’m just missing the edging on my lizard ridge afghan (from knitty) and I’ve already started a mittered square afghan. So much fun! I think it might be one of my favorite projects of yours!! The “petals” way I like a lot better. The squares looked too… quilted. I love the way the petals radiate from the center. You could keep the blanket for your own future little ones. It will be a marvelous baby blanket, where ever it goes. Who wouldn’t be happy to receive that as a gift??? It really is a cute blanket, AND babies like stuff with “movement” like your pattern. I think its cool. Now you have to come over to my blog and tell me what you think of my new pattern. I am not an ole pro at this like you are and would appreciate your expert opinion. That is a beautiful blanket. You are so sweet to use it as a gift. A very special gift indeed. “I was able to get nice, rounded corners by knitting what amounts to a wedge where two sides of the border meet. The actual increases are closed yarn-overs, which I always find stretchy and accommodating when it comes to maneuvering in tight quarters.” ??? I would really learn how to finish a corner like that. I usually sucumb to the applied i-cord edge. Congratulations on your marriage!!!!! God surely smiled on him!!!! !